On Saturday I'm giving a talk on a panel at the Problogger conference. The panel is about blogging for social good - I will be in esteemed company with nutritionist Emma Stirling, World Vision's Stephen Ellis, and 2012's Best Australian Blogger Eden Riley. What a panel! I'm so honoured! When I began blogging - way back in 2001 - I never did it for awareness raising, I did it because I loved writing. My previous blogs were more like diaries. The awareness raising just sort of happened when I started this blog. It's part of looking different and living with a disability. Education is incidental. One day in 2010 when I was very sore, I blogged about it. I posted a picture of my face when it was infected, and I wrote about it. My doctor freaked out, worried I'd opened myself up to ridicule. Only I wasn't ridiculed. The support was incredible people asked questions about my skin. I realised I could tell my story on my terms on my blog. The Internet was understanding, compassionate and kind - and it was only recently - after years of blogging and many photos posted - that my photo was ridiculed. I see blogging for social good as using your blog space and time to raise awareness about a cause or charity. Kind of like volunteering at a hospital or taking part in a fun run. Only you can use your words and photos to spread the message, and there's a chance you'll have a far reach. I blog about what it’s like to look different. I do this to normalise difference. I write about the social and sometimes medical experiences of life with a visibly difference chronic illness/disability – a rare severe skin condition called Ichthyosis. Telling my story has led to freelance writing and speaking and teaching opportunities (including Daily Life, The Guardian, the University of Melbourne, the University of Western England and Writers Victoria) and shaping social perceptions around facial difference and discrimination. Last year I was abused by a taxi driver – he worried my face would ruin his cab. I blogged about it, tweeted about it, it made national news. I put in three complaints – to the taxi company, Victorian Taxi Commission and Human Rights Commission and one of the outcomes I requested was to improve disability training for taxi drivers – to let them know that disability discrimination is illegal, and disability is more than guide dogs and wheelchairs. I called for participants through my blog and worked with the taxi company to develop a training video. That video is here. Sharing my story empowers others to share theirs. I receive messages from readers who are struggling with their appearance, or a new parent to a baby with Ichthyosis, telling me that my story has made a difference to them. Readers tell me they felt alone until they found my blog and can now see some hope for themselves or their child. They have also told me that because of my story, they're confident to tell their story about Ichthyosis to their families, friends or wider communities. "Thanks for sharing your struggles. My 5 yr old son has Ichthyosis and you help me understand him better. You help me be a better mom. I wish there was something I could to to repay you that blessing. It's seriously such a joy to receive messages like this and I'm so grateful. And I've been able to meet so many people affected by Ichthyosis around the world. The friendships I've made are beautiful. Here's Jack and I in London in May. People affected by the condition (both patients and parents) have found my blog and used it as a source of information, and told me that my story offers them some hope. But my story is only one of many, and I wanted to open my blog for others to share their story. I asked more than 40 of my online friends affected by Ichthyosis – patients ranging from seven years old to in their mid 50s, parents of children with the condition, grandparents, the leader of a support group, a dietician and my parents – to share their stories on my blog throughout May. I asked them to show a life well lived – to give hope to others in the Ichthyosis community and also to educate people about the condition (including how it varies), and to break down stigmas of living with a condition that can be so visually confronting. The symptoms, appearances and experiences differ between everyone who has shared their stories. Some people have written about a coming of age experience - working towards accepting their condition, and others have written about how their lives have changed since becoming a parent to a child with Ichthyosis. I collated their posts, editing them and providing feedback to each contributor (some post required more editing than others – not all contributors were experienced writers). I scheduled blog posts for every day in May alternating types of Ichthyosis, age, and location. Finally, I promoted each post twice a day with a picture collage on Facebook, numerous times a day on Twitter and once on Instagram. Promoting the blog posts on social media had a huge reach – most pictures received over 2000 views on Facebook (from 900 followers). I emailed each contributor letting them know their post was published, encouraging them to share it with their networks. And at the end of each week, I summarised that week’s posts in a picture collage on Facebook and Twitter. As the month went on, lots of people affected by Ichthyosis read the stories on my blog, and shared them with their families and friends. The response was incredible - throughout May my blog had over 93,000 views! I had people contact me to ask if they too could share their stories on my blog too, and so I added to the project. 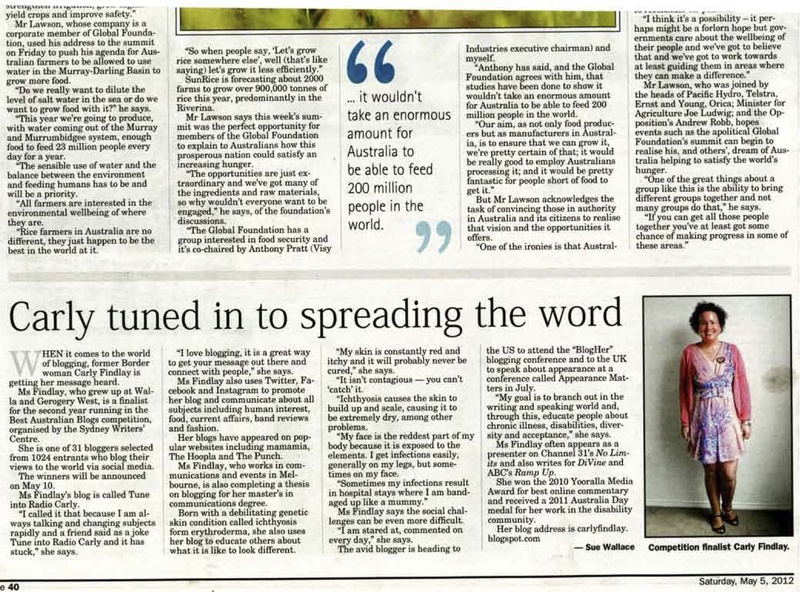 The contributors have been thankful for giving them a chance to tell their story - for some this is the first time they've been so public about their Ichthyosis. They’ve been excited to see themselves in print, and have also taken the time to read, comment on and share all of the other stories in the project. I’ve been able to put families in touch. I am proud that these stories shared are providing hope. On a personal note, I enjoyed learning about the various forms of Ichthyosis and getting to know these (mostly online friends) through their stories. I also featured my parents’ stories, and reading these gave me great insight into the struggles they faced when raising me. My awareness month blog project was picked up by Fairfax’s Essential Baby site and The Australian Writers Centre, plus shared by a huge number of social media users. You can read all of the stories in my Ichthyosis Awareness Month blog project here: 2013 and 2014. The Internet can be brutal to people with disabilities and visible differences like Ichthyosis. I see many nasty comments on pictures of people with disabilities circulated on Facebook. I created this blog project to create awareness and to foster a positive community. So much respect was shown to the contributors to my blog - not one negative comment was received - and so many readers commented that they wanted more stories. I am now opening my blog up to guest posts from people affected by Ichthyosis (and all types of disabilities and visible differences) year round. "I wrestled for weeks to get my story to Carly for her project for Ichthyosis Awareness Month, as I come from a generation where networking didn't exist & even now I feel as though some may frown upon my having shared my past as openly but Carly Findlay & her awareness campaign work & skills in presenting our stories is fantastic and I thank her for encouraging to me do the article despite my reservations & it coinciding with a roller coaster week of family events. Thanks for reading & commenting." I always marvel at how far my blog reaches, and what it's used for. I receive emails from teachers and academics telling me they've referred to my blog in a class about diversity or bullying, or in a paper they're writing. Last week I received an email from a dermatologist this morning, telling me of a newly diagnosed baby. He wants to pass on my blog to the family. "I am asking firstly if you would be happy for me to direct the family to your blog. Also, your advice in managing Ichthyosis is likely to be more valuable than ours and it would be beneficial to have your input." For a little while I doubted my ability to help families when I felt unsupported by the people I'd hoped would find value in what I do through my blog. But getting emails and messages like these make me know that sharing my story is worth it and I don't have to be a parent to help other parents. While blogging for social good is different for each cause, one piece of advice I'd give you is to create content that can be used for education purposes - advice or videos. Make them shareable, create little memes or infographics that can go with links to your blog. I've got a resources page that I can direct people straight to when they ask me what creams I use or what support groups they can join. I promote charities and causes I believe in in my blog. I have worked with Donate Life, the Heart Foundation (via Brand Meets Blog), RUOK? Day, World Vision, Sun Smart, Positive Exposure the What I See Project, and Love Your Sister. I've also promoted the Layne Beachley Aim for the Stars Foundation through my blog after I received a funding grant from them (I am now an ambassador for the Foundation). Before Love Your Sister was launched, I asked Samuel Johnson if he wanted alternative media to spread the word. He knew me, he trusted me and my blog content, he wanted bloggers to get behind this cause, and he said yes. I was the first blogger to cover his story (via a video chat), and covered it through his trip – sharing posts from the LYS FB page, interviewing him mid-way, seeing him at PBEVENT last year, and welcoming him home. "Love Your Sister has received overwhelming support from communities large and small all over Australia, but one of the most powerful voices on our side has been the bloggers. With their generous hearts and clever blog pieces, they’ve spread the Love Your Sister message through channels that traditional media cannot reach, and with a trusted voice that commercial media could only dream of. Of all of these amazing bloggers, Carly Findlay has been our most staunch ally. From the moment Samuel rode off into the sunset on his epic adventure to his triumphant return home one year later, Carly has been with us every step of the way, promoting the mission and reminding women everywhere to check their lumps and bumps. She’s there for us on Facebook as well, liking and sharing and educating. A like from Carly gets you a lot more views than a like from most other people! We’re incredibly grateful for her support. She has been so generous with her time and effort. If you want to be as hip as a world record-breaking long distance unicyclist then you’ll do what they do… and Tune Into Radio Carly!" I have also taken a keen interest in Donate Life – because Camille, one of my best friends was on the transplant list. Though seeing her struggle with doing every day things – things like breathing and walking that we take for granted – I realised the need for organ donation for people to get a second chance at life. I blogged about Donate Life Week several times. When Camille was due to judge a blogging competition to promote Donate Life Week, she asked me to be her back up in case she got the call. She got the call, and was given new lungs from a generous donor. And I was the guest judge, working with Peta and Kerrie from The Ground Swell Project, and recruited Matt from Dad Down Under to help judge too. The Gotye parody by Brooke Huuskes won best film, and this blog post by Alysha Herman won the category I judged. I was so grateful Camille got a second chance at life, and honoured I could use my blog to promote a worthy cause. And last year, after sharing Tina's story about life with Ichthyosis in India, my readers and I wanted to help her. When her mother (her lifelong carer) died I started a fundraiser to help Tina out - we raised $1200 and bought her a cooling vest and deposited the rest of the money into her bank account so she can afford to travel to her dermatologist and to buy creams and other medications. She was so grateful. I recommend approaching a charity or cause (or person) you believe in, tell them how you can help, who your audience is, how your reach will benefit them. I did this with Love Your Sister, and I've also done this when inviting guest bloggers to write about appearance diversity - for example, Robert Hoge, Turia Pitt and Paul De Gelder. Get some testimonials from charities you've worked with. Debra Cerasa, CEO of Multiple Sclerosis Australia (pictured below) wrote this testimonial for me after I delivered a blogging training session to a group of MS advocates last year (I was paid to deliver the training). "It has been my pleasure to observe Carly Findlay in public speaking engagements numerous times. The overwhelming observation I am always struck by, is her ability to connect with an audience. She is real, articulate and genuine. Carly has a warmth and connectivity that many experienced speaker could learn from." Maybe you can become an ambassador for a charity or cause you believe in - show an NFP your readership and social media reach, like you'd show a brand this info. Don't forget the little charities - and make sure the charity you're supporting is legitimate. Check out the National Charity Register that's run by the Australian Charities and Not-for-profits Commission to confirm you're supporting a registered charity. I've experienced a few obstacles - and it wouldn't be authentic if I didn't share these. There can be criticism around disability – assumptions from strangers about work ethic, whether you’re disabled enough, hierarchy of disability. This can also apply to your cause. There will be some people who don't believe in what you do. Criticism if you “sell out” after so long of telling my own story. I remember the first time I was published on the ABC - no payment received - after about a year of blogging here. A woman with Ichthyosis told me how much I've sold out, how disappointed she was in me. I was also told last week that it's disappointing I see my disability as a money spinner by getting paid to write and speak about it away from the blog. Not enough brands working with bloggers who blog for social good – I enquired about blogging for Genes for Genes Day and my enquiry was not responded to – even though I am a blogger with a genetic illness. And it can be hard to get people on board for a condition or cause that is quite unknown. To blog is to be your own promoter - and I spent so much time spreading the message about Ichthyosis Awareness Month through email, on twitter and on Facebook. 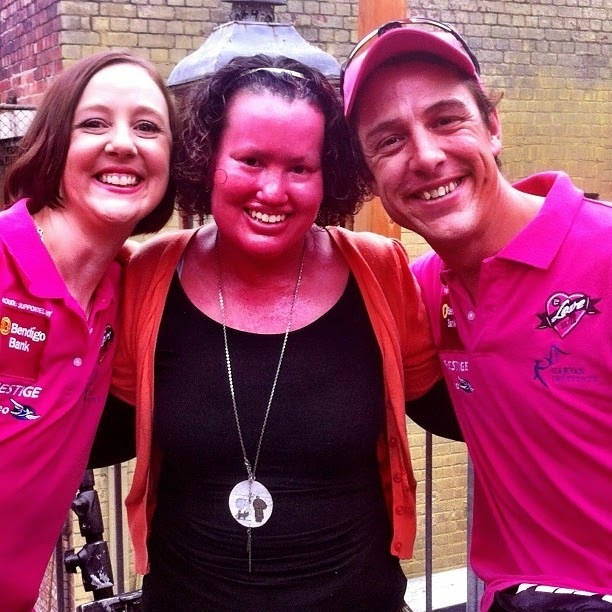 While I was disappointed that some people and organisations that I expected to get behind the project didn't, many others did - including Australian media personalities, and others in the Ichthyosis community. Generally I view blogging for social good as blogging without payment. But there has been one campaign I've done for the Heart Foundation which I received payment for, and I know other bloggers have done similar. I've been lucky enough to make a little money away from my blog - developing my skills and expertise to be used in freelance writing articles and at speaking events. I also see myself as a blogging consultant - I've taught emerging writers blogging and advocacy at the Emerging Writers Festival in May, and am currently putting together a niche blogging course. Soon I will be talking on two other panels - about beauty and about disability art. All of these opportunities have come my way because of blogging. I believe it is so important for disabled writers - all writers, really - to get paid for their work and lived experience. It is empowering and shows that companies value disability advice. I wrote a rant about this here and here last week if you're interested. Other ways bloggers could make money through blogging for social good are through creating ebooks, setting up a consultancy and copyrighting in a speciality area. Overall though, if your using your blog for social good, I think it's good form not to expect payment for writing about a charity or cause on your blog. Blogging for social good is wonderful. It can raise awareness and money, build communities and also show that you as a blogger are a trusted expert in a niche area. It's giving back, using your voice to create change. I never thought blogging for social good would give me the opportunities and connections it has, and every day I'm thankful. So, if you're passionate about a cause or charity, why not use your blog to raise awareness about it? I've seen that quote circulating a bit lately, in the wake of Robin Williams' death. These words are so very true when it comes to blogging for social good. Carly, I hope you are proud of all you have achieved on this blog. It really is a testament to your hard work, dedication and selflessness. You have also given other writers, like me, generous exposure to your audience, and I for one am very thankful. I wish I was going to ProBlogger, but given that I only became a blogger in April this year, it's not surprising that I'd never even heard of the event until recently! I think I'll aim for next year, and hopefully we'll be able to catch up in person. Thanks Carly - another inspiring post. I really wish I could be there to see your presentation at PB. You are doing an amazing public service - but spreading your message and encouraging others to find their voice for social good. Prejudice will always grow if we don't keep talking about it as a society. Thank you for reminding me that everyone has the power to make a difference. Thanks for doing what you do - as mum to a chronically ill child, seeing all the wonderful things you have achieved serves as an awesome reminder that my daughter's illness doesn't define her and that life is for living no matter how other people perceive your limitations.